If you had gone to Yellowstone Park fifty years ago, you would surely have seen several black bears begging along the roads. Nowadays, you are more likely to see elk and bison in the park. However, elk are much less common than they were a few years ago. Their diminished population is blamed partly on the reintroduction and proliferation of wolves since 1995, but factors such as drought and other environmental changes have also played a role. The most visible elk herd is now at Mammoth Hot Springs. 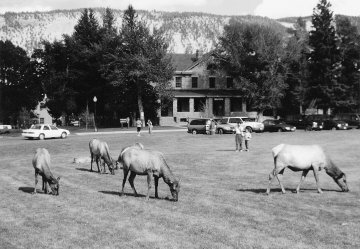 The elk, seen (below) in 1996 in front of the Albright Visitor Center, help keep the grass trimmed. These elk are not tame ones; they’re definitely wild and you shouldn’t approach closer than 25 yards (23 meters). And they are big—mature bulls may be five feet (1.5 meters) tall, nine feet (2.7 m) long, and weigh half a ton (450 kg). If you’ve heard the myth about being able to tell the age of a bull elk by counting the points on his antlers, forget it. Dominant and mature bulls have six or seven points, but they are not necessarily six or seven years old. Wild elk can live to be ten or twelve years of age. On hot summer days, you may see Mammoth’s elk resting among the buildings or lying on the dry terraces. The white travertine (calcium carbonate) of the terrace reflects the heat away, and the elk find few bugs there to pester them. Elk find rich browsing along the Gardner River. 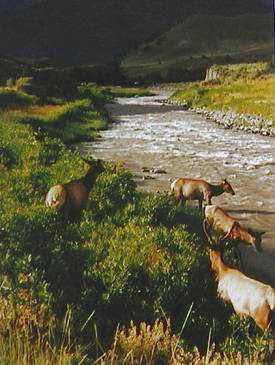 Here is a group of cows and calves crossing just below Boiling River, a favorite bathing spot of locals, park employees, and visitors. CREDITS: The black-and-white photo of the elk in front of the visitor center is by Leslie Kilduff. The other photo on this page is by Mary VanBuskirk. IN THE GUIDEBOOK: Learn about the many animals and plants in “Living Things, A Yellowstone Sampler,” pages 330–55 of Yellowstone Treasures, fifth edition. Revised August 2, 2017. All Rights Reserved.